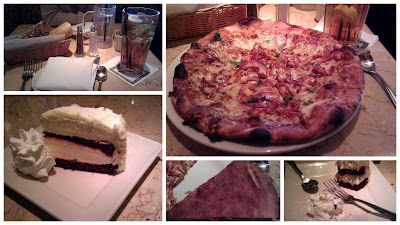 The Pizza Files: The Cheesecake Factory, March 2011. There's one of these in a big mall around Portland. Always see a long line. Must be the cheesecake and not the pizza, huh? For the record, my mouth was watering! For me a 5 to 10 minute wait is to long for even the cheese cake. If you ever go I recommend downloading the menu and studying it for several days prior, so that aren't overwhelmed by the all choices. Of course I recommend the Red Velvet Cake Cheesecake.